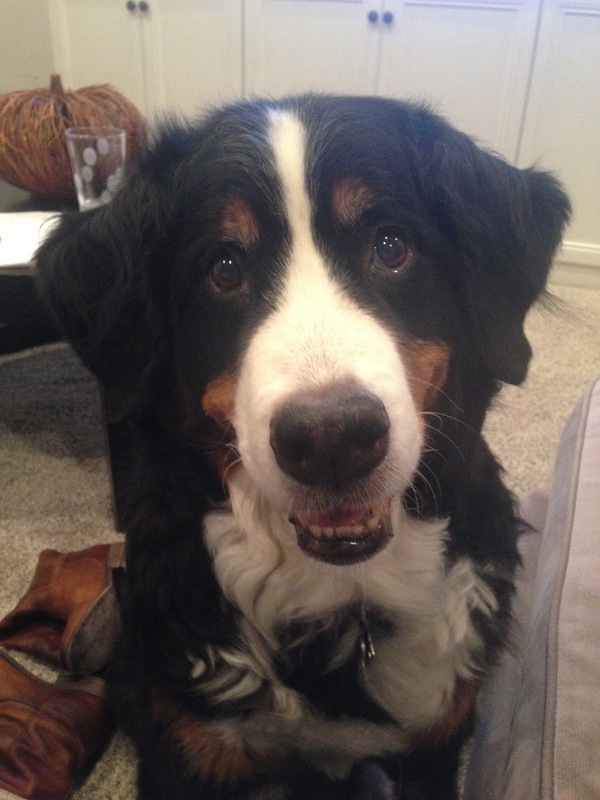 On Thursday, Oct. 22, 2015, we said goodbye to our beautiful, sweet Adler. She lived on this earth for almost 11 years – defying the life expectancy of her breed’s 7-9 years. She was a pretty perfect dog never chewing a toy or shoe that was left out. She traveled through many states with us on road trips and enjoyed many vacations, especially the ones that included the beach. She loved rolling in the sand and running on the shore. I can picture her now running down the beach with a huge grin on her face, tongue hanging out. Run sweet girl, run and jump. Know that I will forever look for you behind the couch and on the landing of our stairs. I will see you in your leftover hair embedded in our carpet and those that are still collecting in the corners of our home. I will remember you forever by the scratches I see on our hardwood floors and on the steps. I will always know the sound of the jingling of your collar and I will recognize it instantly when we meet again. Rest in peace my sweet Addie girl. I love you always and forever. 11/27/04 - 10/22/15. She's gone and my heart is broken. On Wednesday, all Adler wanted to do was lay in the yard. She would go outside for hours on end (something she never did). 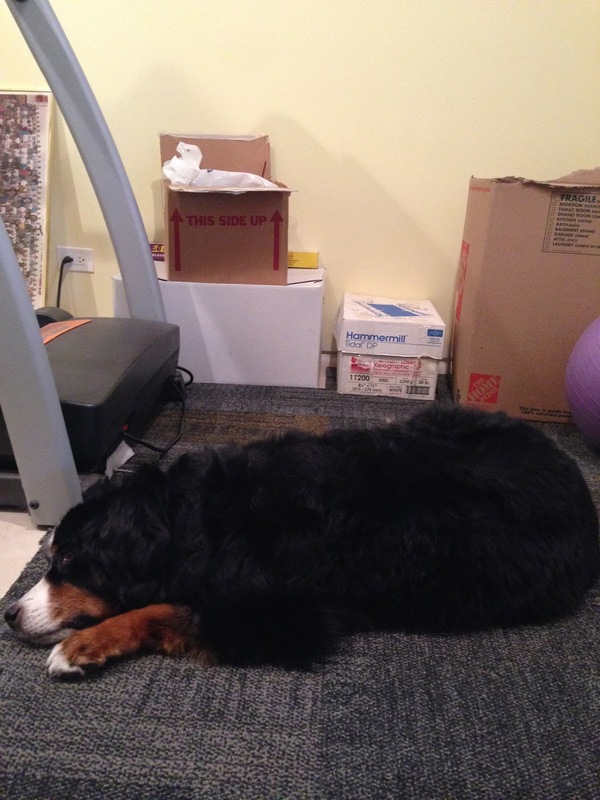 She barely mustered the energy to eat and toward the end of the day she had difficulty standing. In fact, Tom carried her up to bed the last night she spent on this earth because she couldn't walk. 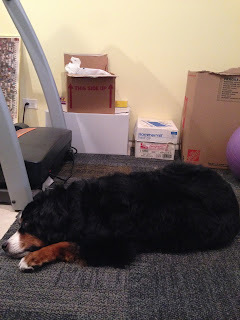 I called the vet hospital as we were scheduled for chemo the next morning and decided I would take her in early to be checked out before any scheduled chemo. At 5am, I awoke to her crying trying to get up. I presumed she had to go to the bathroom so Tom carried her downstairs while I quickly dressed. It was time. I needed to bring her to the hospital. Tom laid her on our front lawn and while I was pulling the car up, we saw her get up for what would be the last time and bolt to the other side of the lawn to go to the bathroom. She then collapsed and we carried her to the car. I drove her 40 minutes away to the vet hospital where they loaded her on a gurney and I told her I loved her for what would be the last time. I never saw her alive again. She went into cardiac arrest pretty soon after we were separated and they couldn't bring her back with CPR. I'd like to think she waited until I was gone to do that so I wouldn't have to see it but it kills me that I wasn't there to be with her those final moments of her life. I also believe that she didn't want me to have to make the decision to end her life. She was going to take that decision out of my hands because she knew how hard it was going to be for me. See, she was the best dog even at the end. I spent about three hours with her after her death (Tom joined me with Hailey as soon as he dropped Austen and Peyton off at school). They brought me to a room and brought her in soon thereafter. I couldn't believe how cold she was getting already and stiff. I kissed her and rubbed her body like I did so many times before remembering every inch of her and taking it all in for the final time. I cut her beautiful fur and kept the striking rust, white and black hairs that I still see all over my house even after the cleaning ladies have come. I know I will see those hairs for a long while. Sometimes they make me feel sad and other times they make me smile. I look for them now. In the spots where she always laid or on my clothes. It's only been three days but I can't bring myself to remove her bed or her treats or so many of the other reminders of her. Seeing the place where her dog bowls were looks so bare. I look for her in her usual spots where she sleeps and she's not there anymore. The house is so quiet now during the day without her, especially when I put Hailey down for a nap and it's usually just Adler and I. That's when I miss her the most. Oh my beautiful sweet Adler, I will miss you and love you forever. You were one of a kind and there will never be another like you. Someday, we'll see you again when you meet us at the bridge. Until then watch over us always and we'll visit you often in our many wonderful memories. We love you. I have dreaded this day since Jan. 23, 2005. It was the day we brought Adler home and she buried her way into our hearts that I knew that losing her some day would be one of the toughest things to go through. And, while we haven't lost her just yet (she is still fighting) her recent diagnosis makes it more real that her time with us is short. About two to three months ago we noticed that Adler wasn't eating all of her food anymore. I had switched types on her recently so I just chalked it up to that and went back to her original food. That helped for a bit but then about two weeks ago she stopped eating entirely and started panting a lot. So off to the vet we went for the full blood work up. Everything seemed good except she showed low platelet counts. The vet did a chest x-ray and abdominal ultrasound only to find her lymph nodes, spleen and liver enlarged as well as a small tumor in her lungs. All signs pointed to cancer so the vet took some tissue samples to determine what type of cancer it was and the results showed lymphoma. This is good news, said the vet. 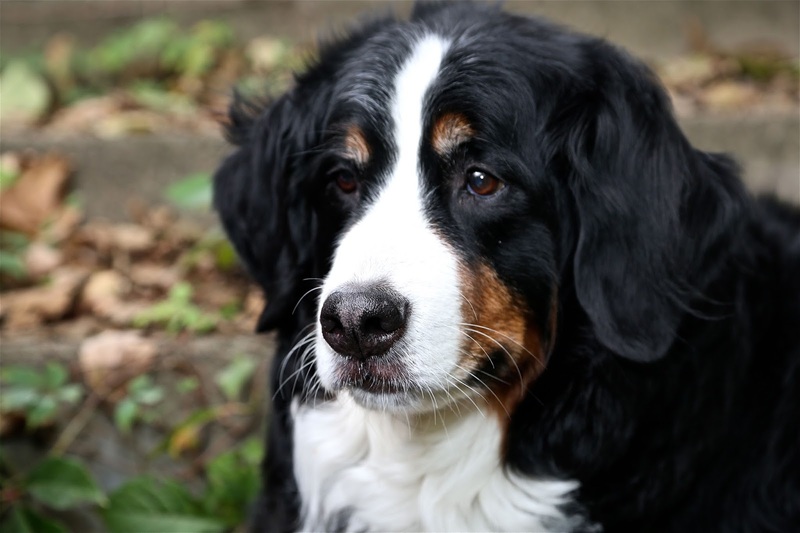 If your dog has to have a type of cancer, this is the best one to have. 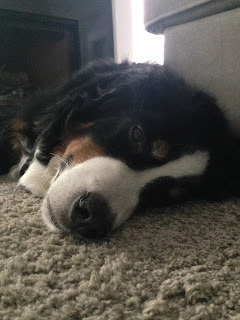 Of course they couldn't determine what type of cancer the lung mass was but we are hoping that one is lymphoma too and not histiosarcoma - one of the most fatal cancers for Bernese Mountain Dogs. We won't know for sure until after several rounds of her chemo treatment then we can check to see if that tumor has shrunk. So we decided to do a 25 week regimen of 8 weekly and then 8 biweekly chemo treatments. She had her first one last Thursday and on day one, I wasn't sure we made the right choice as she was so out of it and lethargic. By day 2 she was definitely more alert and a bit more interested in food. Day 3, she was like her old self and eating her old food. It was like night and day. If this was one treatment, I wonder what 16 will do for her?! All I know is I'm not ready to give her up so soon, and I don't think she's ready to leave us just yet. Average life expectancy after treatment is about 13 months. I hope we get at least that with her. All I know is that each day we have with her is a gift. She is a gift. And, there will never be another who captured my heart as she has. Day 3 of Chemotherapy - who has cancer? I am alert and begging for food! Happy Birthday to Hailey! Can't believe our baby turned 2 today. It was a gorgeous day to celebrate as we had a bit of Indian Summer with a near 80 degree day. It has been so nice to have one child where we can celebrate outside since Austen and Peyton's birthdays are in the dead of winter! We started the morning by opening Hailey's presents from our little family. Austen and Peyton each got to pick the presents they gave to Hailey and helped to wrap them too. I don't know who was more excited about Hailey's birthday though, them or Hailey! We had to remind the other two whose birthday it really was more than once. Anyway, since it was a Paw Patrol birthday party, Hailey received a lot of Paw Patrol! She was in Heaven and carried her favorite character, Zuma, with her to Austen's soccer game later that morning (Despite losing, Austen still scored the only goal for his sister). Later that afternoon, we celebrated with family. She tried out a jumpy house, played a lot of Paw Patrol with her family and ate lots of popcorn! She received even more Paw Patrol (and some Minnie Mouse). Again, I don't know who was more excited, Hailey or Austen and Peyton! Peyton more than once asked if we could open up Hailey's new toys so she could play with them. She loved opening her presents but immediately wanted to play with what she opened instead of moving onto the next present - and who could blame her! Those were some cool toys that she received! She really had a great day until we went to sing happy birthday to her. I don't know if it was the fire or everyone singing happy birthday to her but she really did not like it all! She cried through all of our singing (maybe our voices were bad!). At any rate, it was a great day to turn 2! Since kindergarten started, I have seen glimpses of an almost 6 year old Peyton. One who seems focused on what she's doing, who helps her sister and wants to please those around her. Note I said glimpses as she runs after Austen hitting him with a plastic bat and thought cleaning up her toys was too hard and waited til Austen and Daddy stepped in so she didn't have to - all just today! However, she is so proud to go to elementary school with her brother and participate in school events like their back to school fundraiser that had each class running a 1K. Much to our surprise Peyton was excited to run and ran the whole way without walking. She looked determined too! She also enjoyed going with Austen this year to a special Breakfast with Dad event at school where she created a sign telling her dad how much she loved spending time with him. Lastly, she has shown great perseverence playing soccer. While almost all the girls on her team complain or cry, she plays the whole game without asking to sit out or saying when is this over. Funny how being a proud soccer mom sometimes has nothing to do with goals and assists but everything to do with just getting out on the field and playing with no complaints. From what I have seen from other 5 year olds, Peyton is doing just fine!